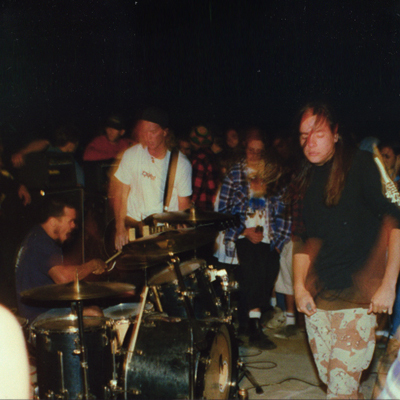 Kyuss – the quintessential stoner rock band used heavy riffs with detuned guitars through bass amps. The resulting sounds bent minds and defined a genre. Rooted in grunge and influenced in part by early Sabbath they forged a sound that was fresh and unique. Founded in 1987 and split up in 1995 they recorded 2 EPs and 4 full lengths. Produced by Chris Goss and eventually signed by Elektra records the band featured John Garcia (vocals), Josh Homme (guitar) Chris Cockrell (bass 1987-1990), Nick Oliveri (bass 1990-1993), Scott Reeder (bass 1993-1995), Brant Bjork (drums 1987-1994), Alfredo Hernandez (1994-1995). The band continues to grow a huge cult following posthumously as their records resonate beyond time to influence a new generation of stoner rockers in Europe.